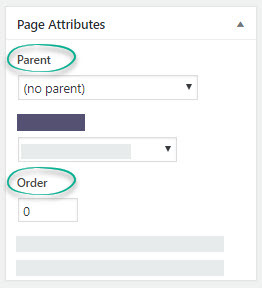 How Can I Create A Child Page or Dropdown Menu? Although using custom menus adds an extra step to menu management, we recommend using them for the additional flexibility. Overview. Pages will no longer appear automatically on your menu. You must go to Appearance > Menus > create a menu > add the pages you want, and drag and drop to arrange. Return to add new pages to your menu later. Header and Footer menus. You can now create header and footer menus. Set your header menu to "Primary". If you want a footer menu, create another menu and set it to "footer." Sub-menu items and dropdowns. You can make any page a sub menu item by dragging it under another page and indenting it a bit. Ordering your menus. Drag and drop menu items to re-order them. Adding links to other sites. You can add external links. Use the "Link" box - add the URL, the name of the menu item, and click create. Exclude pages. To exclude pages, just leave them off the menu. Unless you use custom menus, WordPress will by default add all your published pages to your site menu. Sub-menu items and drop-downs. You can make any page a sub menu item by giving it a "Parent." When adding or editing a page, look on the far right, under the Publish box, for 'Page Attributes' setting. Ordering your menus. You can order your menu items by giving each item an "order" number. When adding or editing a page, just look on the far right for the "Order" field and enter a number. ALL pages must have an order number for this to work. Adding links to other sites. You CANNOT add external links unless you use custom menus - see above. Exclude pages. You can exclude pages by installing a plugin exclude pages plugin. *Because third-party plugins are developed and maintained by other developers we cannot guarantee compatibility, nor can we provide support for them.